In addition to keeping your computer healthy, it’s important to think about your own health. Using a computer involves a lot of repetitive motions such as typing and using the mouse. Over time, these motions can begin to negatively impact your body, especially your wrists, neck, and back. Staring at a monitor for long periods of time can also cause eye strain. To minimize these risks, you should take a few moments to make sure your workspace is arranged in a comfortable and healthy way. Watch the video below to learn more about arranging your workspace to avoid strain and injury. Computer ergonomics is the science of equipment design and how specific equipment usage and placement can reduce a user’s discomfort and increase productivity. Some equipment is designed with special attention to ergonomics, like ergonomic keyboards and ergonomic chairs. Here are a few tips to help you avoid injury in your workspace. Adjust your chair: Make sure your chair is adjusted to allow you to sit in a natural, comfortable position. Many office chairs are specially designed to support the lower back and promote good posture. Keep the keyboard at a comfortable height: Try to place the keyboard in a position that allows you to keep your wrists straight and relaxed to avoid wrist strain. Many desks have a keyboard tray that can keep the keyboard at a better height. 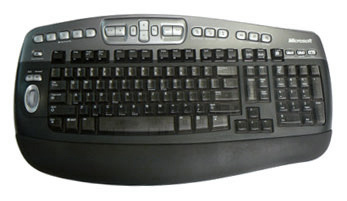 You can also buy an ergonomic keyboard that is designed to minimize wrist strain. Keep the mouse close to the keyboard: If possible, place the mouse right next to the keyboard. If the mouse is too far away, it may be uncomfortable or awkward to reach for it. Place the monitor at a comfortable distance: The ideal position for a monitor is 20 to 40 inches away from your eyes. It should also be at eye levelor slightly lower. Avoid clutter: The computer area can quickly become cluttered with paper, computer accessories, and other items. By keeping this area as uncluttered as possible, you can improve your productivity and prevent strain and injury. Take frequent breaks: It’s important to take breaks while you’re working at your computer. To avoid eye strain, you should look away from the monitorevery once in a while. You can also stand up and walk around to avoid sitting in the same position for long periods of time. Programs such as Workravecan automatically remind you to take breaks. For more information on setting up a computer workspace, visit the Computer Workstations eTool from the Occupational Safety & Health Administration (OSHA).